The National Renewable Energy Laboratory in Golden, Colorado released a document last year on the viability of fuel cells for various applications, including transportation. The National Fuel Cell Electric Vehicle Learning Demonstration Final Report, “analyzed data from more than 500,000 individual vehicle trips covering 3.6 million miles traveled and more than 152,000 [kilograms] hydrogen produced or dispensed.” The agency tested 180 vehicles over a six-year period. At least two fuel cell manufacturers report results exceeding these numbers, so the major impediment to wide-spread implementation of this clean technology seems to be lack of an effective distribution network. The NREL lists 54 existing H2 sites, with 15 projected for the near future, nowhere near the estimated 159,000 outlets (including convenience stores) that sell gasoline and other petroleum products. Hydrogen distribution can take many forms, though, and only really works from a “green” standpoint if the total processing and distribution do not require the use of “dirty” fuels or exceed the energy expected to be derived from the hydrogen. Two British firms have promising results that could make it worthwhile to increase H2 production and expand the distribution network. ACAL Energy, a chemical engineering company, has announced test runs over 10,000 hours, equivalent to 300,000 miles of driving, for one of its PEM (proton exchange membrane) fuel cells. This is “comparable to the best light-weight diesel engines under such test conditions, according to ACAL, and “far exceeds” DOE’s 2017 target of 5,000 hours or 150,000 road miles. ACAL’s FlowCath® technology does not use expensive platinum catalysts and seems not to have degraded during its long run, much better than DOE’s expected 10-percent loss of its shorter run time. ACAL Energy has tested its “proprietary design fuel cell” with “an industry standard stress test protocol with a start-stop at the end of each cycle.” The cycle was repeated 24 hours a day, seven days a week, and simulated a vehicle trip with frequent stops, starts and a highway cruise. The test accelerates aging and stress wear on car engines and fuel cell systems over time. Instead of employing a platinum catalyst as in more conventional fuel cells, ACAL Energy uses FlowCath®, a patented liquid catalyst that acts as both catalyst and coolant while reducing the cost of the system and eliminating most of the known decay mechanisms. Intelligent Energy has been working with scooter and motorcycle mobility for the last decade, and has expanded its offerings into other mobile and stationary power applications. While expressing concern for the problems involved in establishing a hydrogen distribution network, the company predicts that the cost of creating that network will be no greater than that needed for an equivalent battery-charging network. Their report, A Portfolio of Power-trains for Europe: a Fact-Based Analysis: The role of Battery Electric Vehicles, Plug-in Hybrids and Fuel Cell Electric Vehicles, details a road map for creating the network and making it an economically and logistically viable system. It includes, as promised by the title, comparisons with battery and hybrid vehicles and the infrastructures necessary to support them. Intelligent Energy makes two types of fuel cells, using air cooling or evaporative cooling as part of a design philosophy that lowers the cost of fuel cells while ensuring long cycle lives. Their air-cooled system conducts heat from the fuel cell stack to cooling plates and removes that heat through airflow channels, simplifying things. They have adapted this system to two-wheel vehicles and as a range extender for small cars. The air-cooled units can be configured to operate within the temperature range -40oC to 50oC, something that is more problematical for batteries. Its high efficiency delivery of “clean” DC power and simple, low-cost design are available in 1 kilowatt and 2.5 kilowatt single-stack modules which can be combined for higher power applications. For consumer electronics, the technology comes in 2 Watt to 100 Watt forms. Air cooling eliminates the need for humidification systems. 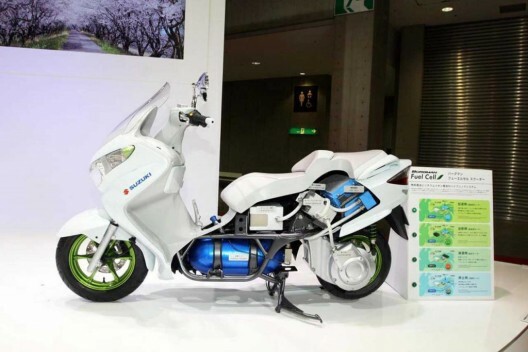 Intelligent Energy retrofitted this type of system to a Suzuki Burgman 125, and even with a fuel cell and battery power system achieved the same 170 kilogram (374 pound) weight as the unmodified scooter. It has demonstrated a range of 220 miles between hydrogen refueling, which can be accomplished in under five minutes. The firm’s evaporative cooling (EC) system allows subzero startups from -25°C in less than 60 seconds. Its “novel system architecture and proprietary water management” allows operation in extremely cold environments. In contrast to the open cathode on the air-cooled system, the EC system uses a pressurized, closed cathode, with cooling air provided by a blower/compressor. A thin, single-piece, bipolar plate requires no pre-stack humidification and no cooling plates. 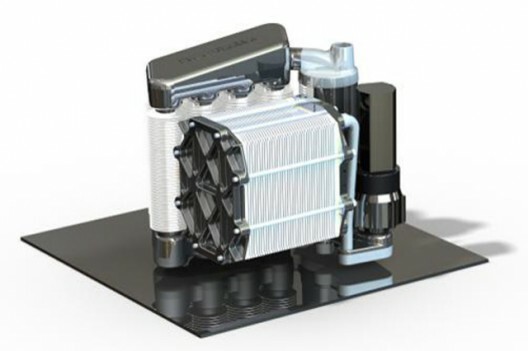 The design provides a high power density over 2.5 kW per liter, high hydrogen utilization from low-pressure delivery and stable performance. Their systems were used on a fleet of London Taxis, which whisked VIPs to Olympics events around the city in 2012. With continuing progress in fuel cell development and the demonstrated economies achievable with vehicle systems, it would be encouraging to see further development of the distribution infrastructure necessary to make such travel a practical reality. A well tested H2 fuel Cell transport system.